President Reuven Rivlin today, Wednesday 14 October spoke and laid a wreath at the official memorial ceremony for Israel’s first prime minister, David Ben-Gurion, marking 45 years since his death. Prime Minister Benjamin Netanyahu, IDF Chief of Staff Gadi Eizenkot, President of the Supreme Court Esther Hayut and members of the Ben-Gurion family also participated in the event. The president began by describing how, in September 1953, then prime minister David Ben-Gurion took a seven week long break to reevaluate the state of the IDF and the security needs of the nation. “The result was a document that, until today, is considered one of the most significant expressions of Israel’s security concept,” he said. 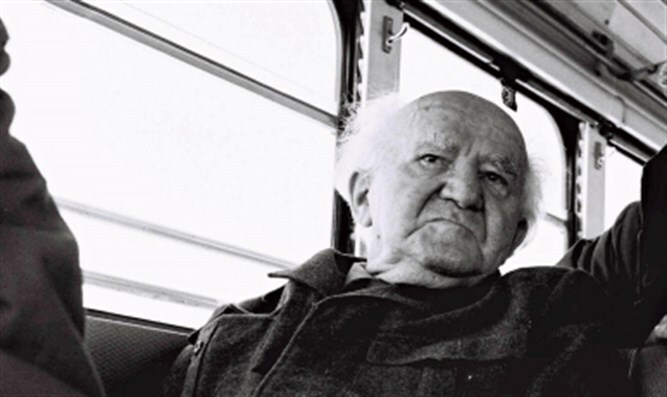 “Ben-Gurion considered war to be a matter of time, but he also knew that our security was not only dependent on the IDF.” The president quoted Ben-Gurion: “’There is not a military expert who does not know that the army’s morale is the key factor in victory, and our army is tasked with being both school and factory, to educate Jews and human beings and to make a people out of a collection of distant tribes.'" "I cannot tell you that I have become a Ben-Gurionite. But in recent weeks and months I have met and heard Israeli citizens, residents of the south and the area around Gaza,” said the president, “and I do not give them strength; these people are the strongest there are. There are wonderful young people. Youngsters who have grown up with 15 seconds’ warning. The pioneers of Sderot, of Netiv Ha’asara, of the Eshkol region. They are the spirit, and with them we will be victorious. And alongside them, there are the men and women of the IDF and the security forces. I met the family of Col. M in the terrible moments before the funeral. I spoke to the family of the officer who was injured with him. Their Zionism, their belief in the State of Israel, their sacrifice and their devotion should be an example and a guide for us all. These heroes embody the values of the Declaration of Independence in their lives and in their death." "The south is Israel’s ‘golden ticket’, taught Ben-Gurion," said the president at the end of his remarks. "We must not forget that. When the cannon roar, the muses are silent, but when we silence the cannon we will have to give these wonderful people, these wonderful communities, blue skies of hope. In the footsteps of Ben-Gurion, we must remember that fighting for the south, for the Negev – even the northern Negev – is not just fighting against terrorism. The battle for the Negev is also a battle for culture, for creativity, for art, for economy, for education, settlement and employment. That is the spirit of the people."